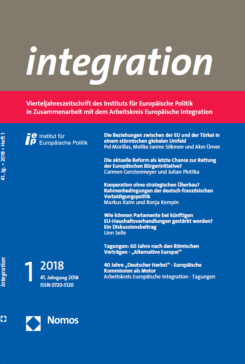 In the new issue of integration, Pol Morillas, Melike Janine Sökmen and Akın Ünver present the global movements, trends and actors driving EU-Turkey relations and predict that under these circumstances conflictual dynamics between both actors are likely to increase. Carmen Gerstenmeyer and Julian Plottka focus on the European Citizens’ Initiative and discuss selected reform elements with regard to their potential contribution to further democratise the EU. Markus Kaim and Ronja Kempin analyse the Franco-German security and defence cooperation and assess how far the level of ambition of both actors converge also with regard to current EU dynamics in this field. Linn Selle discusses ideas on how to strengthen parliamentary bodies on the national and European level in order to exert their full budget authority. The issue contains also a summary of the annual conference 2017 of the Institut für Europäische Politik and the final conference of the project “Alternative Europa!”. The ‘Arbeitskreis Europäische Integration’ reports on conferences about the role of law to provide security and the capacity of the European Commission to act as a force for cohesion. This article presents the global movements, trends and actors driving EU-Turkey relations: namely, the global shift of power, the declining liberal international order and the rise of authoritarianism, populism, the new US foreign policy under Trump and Russia’s rise under Putin. It analyzes the impact of these drivers on the EU and Turkey respectively, and proposes the most likely scenario on the future of EU-Turkey relations under this constellation of drivers. It argues that the transformations at the global level have diminished the capacity of the EU to act as a “force for good” in international affairs which, coupled with Turkey’s will to emerge as a global actor, is likely to increase conflictual dynamics between both actors. The Current Reform: The Last Chance to Save the European Citizens’ Initiative? Since 2012, EU citizens can use the European Citizens’ Initiative (ECI) to invite the European Commission to propose a legal act on matters, where they consider EU regulation necessary. Considerable practical problems in the ECI process, both for organisers and supporters, make a reform necessary in order to render the instrument more citizen-friendly. In April 2017, the Commission started the reform, which shall be concluded by the end of 2018. Against this backdrop, the article reviews the state of art of research on the ECI and presents an overview of the procedure before analysing data on the instrument’s use by citizens. Finally, selected reform elements are discussed with regard to their potential contribution to further democratise the EU. Germany and France have pushed forward security and defense cooperation during the last months. Bilaterally, they agreed on a wide range of future armament cooperation and multilaterally, they gave momentum to the long dormant process of Permanent Structured Cooperation (PESCO). The majority of EU member states wants to use PESCO to facilitate military integration within the framework of Common Security and Defence Policy (CSDP) and to make better use of their military capabilities. However, this progress should not hide existing differences between “Paris” and “Berlin”. On the one side, there is no agreement about the functional dimension of CSDP – what should it be used for? On the other side, the level of ambition with regard to further integration remains disputed despite the talk of a “security and defense union”. The article sheds light upon the position of the European Parliament and the German Bundestag during the negotiations on the Multiannual Financial Framework 2014-2020 (MFF), as both parliamentary levels play a formal role in the budgetary process. While there have been strongly diverging views as to the institutional priorities of the MFF (such as the size of the budget and its revenue), similar party-political positions prevailed with regard to the overarching political priorities the MFF should be oriented towards. Against this empirical background, the contribution discusses ideas on how to strengthen parliamentary bodies on the national and European level in order to exert a full budget authority. Preise 2018: Jahresabonnement Privat (Printausgabe inkl. Onlinezugang) 78,– €; Jahresabonnement für Studierende (Printausgabe inkl. Onlinezugang) 44,– € (bitte Studienbescheinigung zusenden); Jahresabonnement für Institutionen (Printausgabe inkl. Onlinezugang) 124,– €; Einzelheft 22,– €. Alle Preise verstehen sich inkl. MwSt. zzgl. Vertriebskosten (Vertriebskostenanteil 10,81 €, plus Direktbeorderungsgebühr Inland 1,61 € p.a. ).